"We promise to offer you everything you need to relax making for an unforgettable holiday..."
But does the brand new 4 star ClubHotel Riu Costa del Sol live up to its promise? Malaga Travel Guide went undercover to find out. In this honest and unbiased review I cover everything in detail from the service at check-in, quality of food, kids facilities, entertainment and spa. Even the alcohol content in the Mojitis…don’t worry you can thank me later. 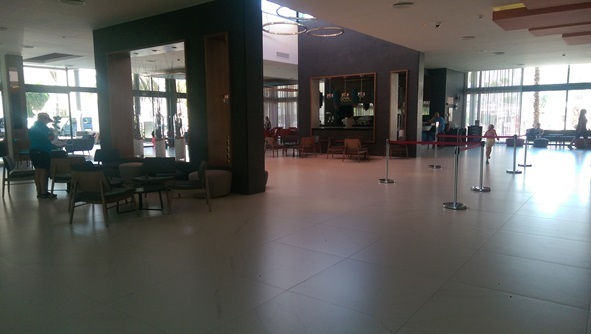 I first heard about this hotel earlier this year when there was a lot of hype about the opening of not so much a new hotel but the combining of two previous smaller hotels in the well known Riu chain. The Riu Belplaya and Riu Costalago in the popular resort of Torremolinos. Both having just recently undergone a major refurb to create the huge ClubHotel Riu Costa del Sol, right on the beach promenade and ready for the 2017 holiday season. The hotel sounded great for us as a family as well as appealing to many of my readers that regularly contact me looking for hotel recommendations. 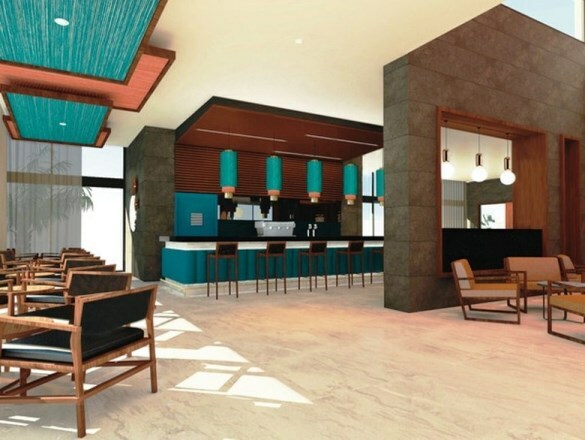 There are tons of hotels along the coast so competition is fierce and I wanted to know if the newest addition from the Riu chain offered something different. 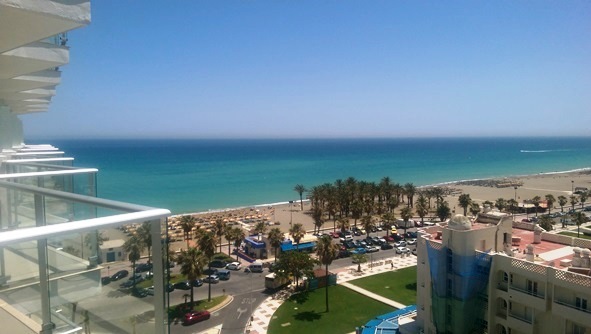 Torremolinos itself has recently undergone a face-lift in a bid to smarten up many areas including the main town centre in order to appeal to a wider market. Meaning the new Riu addition fits right in. Driving down the road running parallel to Torremolinos beach we spotted what we thought must be the ClubHotel Costa del Sol as the bright whiteness and newness of the building stood out among the other tall buildings in the area. We were not wrong and saw on our approach the distinctive Riu sign indicating we had arrived. We drove round to the main entrance and found a free parking spot just a little further up on the street. The hotel offers underground secure parking for 7 euros a day, not badly priced compared to most. Reception and Rebujito lobby bar. The main reception area is bright and airy with a mix of seating from sofas to tables and chairs, with a lobby bar Rebujito to the left of the entrance. Now I’ll be honest, I don’t usually like lobby bars, I find them to be drafty because of their proximity to a main entrance and a bit well…lacking in atmosphere. But this I liked the look of and could easily see myself lounging on one of the sofas with a nice cool drink in my hand. Must check-in first though…. There was no line and we were welcomed straight away by Eckhart who was friendly, informative and efficient. Check in was a breeze and I liked that he gave us little hacks like “grab a bottle of water from the bar to take to your room if you need to”, of course this was an All Inclusive hotel so why not. He also pointed out where we could find the kids splash pool for our daughter and which restaurant was still serving lunch, nice touch. Then as if he was almost pre-empting my next question he produced the wifi code which was free and could be used throughout the hotel. Wifi is limited to two devices per room but it worked perfectly well during our stay in all areas of the hotel. We booked a large double room which was accessible via lifts and was on the 8th floor in the main building to the front so we had amazing side sea views being so high up. There are 9 floors in total and Eckhart had already pointed out that there would be no noise from the hotel bars which were also mostly in the same building but on the ground floor. Hmmm I’ll reserve judgement on that until the morning. Double room with additional sofa bed. The room was modern, new and clean and even with the sofa bed which was already made up for my daughter It felt roomy and spacious. There were two additional double beds, plenty wardrobe space (with a safe) and draw storage by the beds. There’s a flat screen TV mounted on the wall opposite the bed which has some English channels like FOX and World News. In the corner of the room was a mini fridge, perfect for keeping water chilled, no tea and coffee making facilities but as were were full inclusive this didn’t really bother us. The double doors opened out onto an average sized terrace with patio furniture and a clothes dryer. View from our 8th floor balcony. The bathroom was a pretty good size with a double sink and a fantastic walk in shower almost big enough for the three of us. I actually fell in love with the metallic wall tiles on the shower wall, I really wasn’t expecting it to be so lovely. A decent hairdryer was attached to the bathroom wall next to the mirror and plenty of shelf storage under the sink unit. Bring your own toiletries as Riu only provide shower gel in the form of a dispenser on the shower wall and hand soap by the sink. Not a problem for us as we always travel fully equipped with everything we need. Once back downstairs we went to grab a late lunch, there is literally food available 24 hours a day here, as one restaurant closes, another one opens. There are three restaurants on site all around the main building to the front of the hotel. Maria Sardina Andalusian buffet Restaurant was open for lunch and was serving up a good selection of starters, mains and desserts. Fish and meat were being cooked fresh but my daughter was most interested in the ice-cream corner complete with sauces and sprinkles. 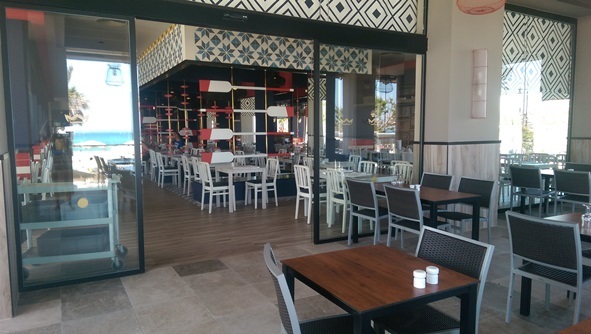 The restaurant itself is clean, bright and modern and has lots of indoor seating and also a patio for Al fresco dining overlooking the main pool and the beach to the other side of the road. It was very quiet, probably because it was 3pm but this didn’t affect the quality or quantity of the food as it was all nice and hot and very fresh. For families with young babies there were plenty high chairs dotted around the dining room too. Drinks are on a help yourself basis as we would become used to around the hotel, red, white and rose wine is available on draft as was cold Cruzcampo beer. The wine is good too, unlike in other All inclusive hotels I have been to (without naming and shaming). 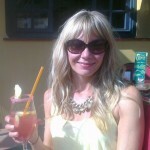 My husband drinks red and I drink white or Rose so all were sampled and given the thumbs up. Juices, water, tea, coffee and ice were all well stocked and on a help yourself basis. Of course you could go to one of the 6 bars and order your drink if you prefer. Cocktails and spirits are only available at the bars but we found during our stay there were always plenty of bar staff meaning we never had to wait long. After a nice lunch my daughter was practically begging me to get to the splash park so we made our way through the hotel gardens, back through reception and out to the other side. Here we picked up some fresh towels and grabbed beds by the splash pool. Although the hotel is large it has plenty signs pointing to where everything is and it really didn’t take long to get our bearings. 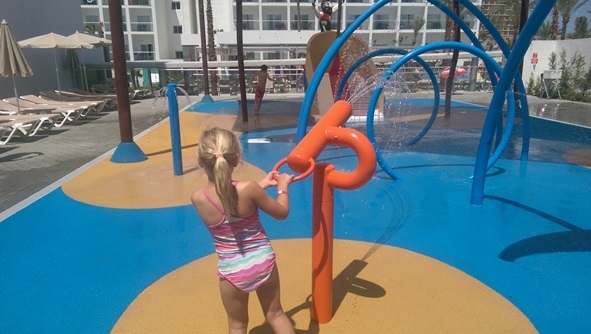 The splash park is in a fenced off area accessible through a closed gate and has been thoughtfully designed with toddlers and pre-schoolers safety and enjoyment in mind. There are loads of beds around the splash park so parents can work on their tan while keeping a close eye on little ones. Slipping and sliding at the splash park! There are 2 additional pools at the back of the hotel, both a decent size with two bars close by and actually warmer than expected for the time of year. Sherry pool side bar and El Jardin de Lola are the two bars closest to the pools, as well as self service drinks stations. In winter one of the pools is heated, and there is also an indoor pool which is open in winter time making this a great all year round destination. One thing the Riu chain is well known for is their entertainment program and they have dedicated one of the pools to activities with well organised games of water polo etc at various times of the day for adults and teens. Adjacent to this is a small kids pool for babies and toddlers. We found there was plenty of sunbathing areas during the day to either be among the action or to find a quiet corner to relax with a book. Riu have installed some clever awning style canopies around the sun loungers which can be opened or closed to provide shade in the heat of the day. I have never actually seen these before in any hotels and thought they were a great idea and also a nice alternative to parasols which can get in the way. 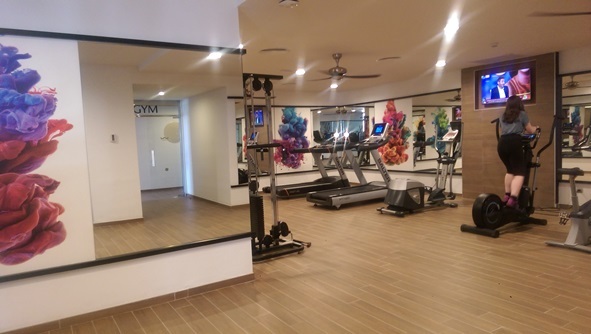 Just behind the reception building in a quiet-ish corner there is a RiuFit area where group exercise classes are held, its well shaded and has rubber gym flooring. Some of the classes include Zumba, Aerobics, Yoga and Salsa. 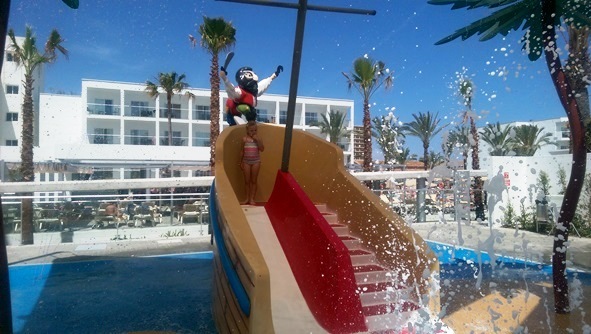 The Riu land kids club is also just behind the Sherry pool bar and although my daughter didn’t use it, there were some great organised activities available in the morning for kids and then again the afternoon. The activities are organised into age ranges of 4-7 and 8-12 supervised by English speaking child minders and are all included within the price. Had we been there longer we would have definitely used the kids club as a welcome break for us parents to grab a drink in peace or maybe indulge in a spa treatment. 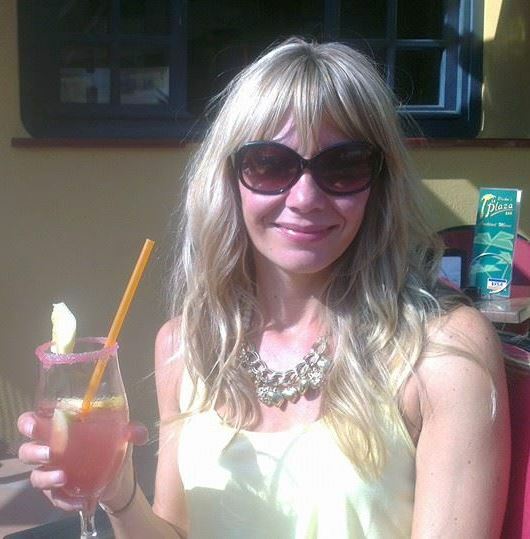 Talking about drinks, and lets face it we all like a drink or two especially while on holiday. But solely for your benefit of course I sampled a couple of drinks from the bar menu. Now I am partial to a Mojito and my husband loves a G&T so we took advantage and ordered a drink each from the Sherry pool side bar while my daughter was having a swim with her new friends. A good choice of cocktails, spirits and soft drinks at the bars and there was plenty of alcohol in both the Mojito and the gin and tonic. Branded spirits like Bacardi and Larios gin were used and they even put fresh mint in the Mojito, delicious even if a bit sweet for my taste. I think one of my favorite areas of the hotel is right at the back at the hotel, the El Jardin de Lola bar. It was always really peaceful down there as most people tend to sunbathe by main pool closest to the restaurants at the front of the hotel. The music was nice and ambient and its a great little place to grab a drink after a workout or Jacuzzi in the spa next door. I did take a sneaky peak inside the gym and spa and had we been staying longer I would definitely have use the gym to burn off a few of those extra calories. It’s a decent size and fairly well equipped for a hotel gym with a mix of cardio and weights machines. The indoor pool although not huge will be a welcome addition for guests in the cooler months if its too cold to swim outside. 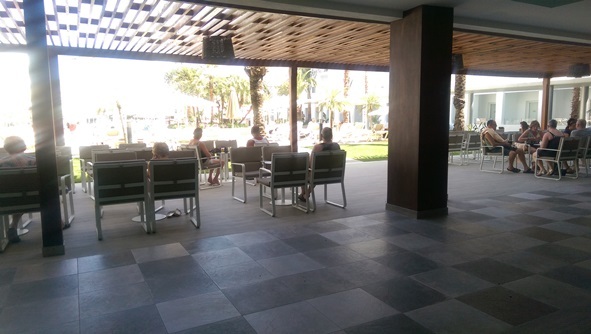 All of this is housed in the spa area just next to the El Jardin de Lola bar at the quieter end of the complex. Spa treatments are surprisingly well priced for a hotel spa. I was very tempted to book in for a Seaweed Body Wrap priced at just 38 euros after chatting with one of the beauty therapists in the spa reception. After a fun day trying out the different pools at the hotel we showered and changed for the evening. Both the shower and hairdryer were really powerful and the bathroom mirror a good size for doing hair and make-up etc. Bonus points to Riu for the double sinks in the bathroom. 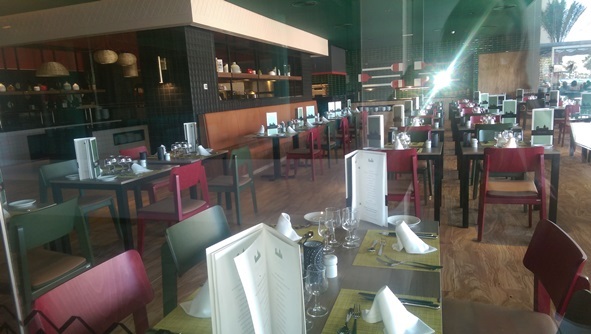 All three of the restaurants at the hotel are included in the holiday price, however reservations are needed for the Italian La Dolce Vita which offers table service for main course although starters and desserts are buffet style. We chose to eat at the Ajo Blanco main dining room for our evening meal which is just outside the lifts in the main building and has themed evenings a couple of times a week. All of the restaurants are nicely spaced out from each other and centered around the main entertainment stage. The only one which offers outside dining is the Maria Sardina restaurant also known as the ‘Andaluz’ restaurant which can be a bit confusing. The guy who welcomed and seated us at Ajo Blanco is possibly the happiest man I’ve ever met, so friendly and enthusiastic, it was infectious. The restaurant was not too busy when we arrived shortly after 7 and we were able to get our drinks and food without having to wait or line up among other guests, it did however get progressively busier as time went on. All food was very fresh with chefs standing behind the scenes cooking fresh food all the time. I started with a selection of salad from the cold starters, all clearly labelled in English so we knew exactly what we were eating. Followed by white fish with veggies. My daughter loved the choice of pizza and Spaghetti Bolognese and of course loads of fresh fruit and desserts, all very tasty, hot and nicely presented. Just outside the main dining room is a sports bar which wasn’t open during the time we were there but I imagine opens for big sporting events and premiership football games. Just behind this is the main stage with loads of seating and two further bars La Carihuela and La Malaguena, both open late as this is where most people come after dinner. The area is all open air but the seating for the stage has a covered ceiling which would be great for cooler nights off season. Every night at 8.30pm the Riuland kids team put on a mini disco on the main stage for the little ones to have a dance and a sing along for 30 minutes. My daughter had a great time dancing and singing along to the popular kids songs, mainly in English but a couple of Spanish I think too. The entertainment team then put on a show each night from 9.30pm which lasts an hour or so, the team work really hard and the shows are generally very good. The show we watched “Hot Stuff” was full of great 70’s disco tunes I just couldn’t help sing along too. Afterwards guests are invited to get up and dance with the entertainment staff, we’d had a couple of G&T’s watching the show so were quite willing to join in. Prefer something a bit quieter? 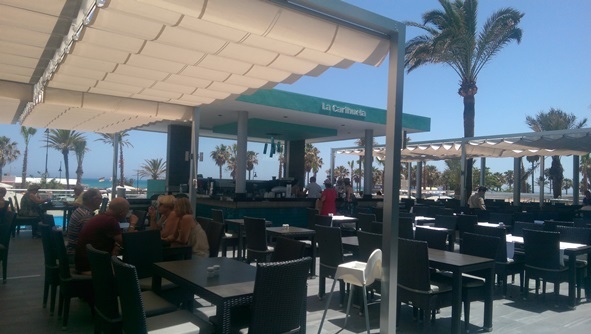 Then head down to the opposite end of the hotel to the El Jardin de Lola bar where you can enjoy a quiet drink and listen to nice background music rather than the party atmosphere in the main building. We left the party still going strong about 10.45pm, back in the room Eckhart was right, no noise at all from the street outside or the bars below. Comfy bed and pillows coupled with a cosy quiet room made for a great night sleep. As if the restaurant had never closed all night we were greeted by the same guy at breakfast who was here last night as cheerful as ever. Breakfast at Ajo Blanco was good, loads of fresh bread, fruit, yogurts, croissants, pastries, porridge and cereals as well as the good old British bacon and eggs. All buffet style, plenty of it, fresh and delicious, washed down with a nice cuppa and glass of orange juice. Choice of bread and pastries at breakfast. Reluctantly we checked out of the hotel after breakfast, much as we would have loved to spend a little bit longer here exploring the beach and local area, our time was up for now…but we will definitely return. 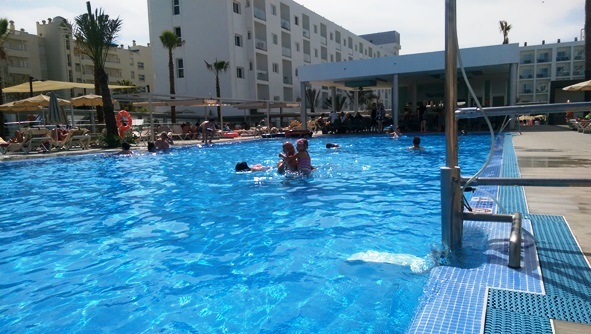 Based upon our stay at the ClubHotel Riu Costa del Sol, we think this hotel would suit families with kids of all ages. The variety of activities during the day means kids will never get bored here. Not forgetting the beach just over the road from the complex with daily water sports in season. Couples looking for a relaxing holiday will equally enjoy a holiday here. For fitness fanatics the range of activities and fitness facilities means that if you want to keep up with your exercise routine then its got everything you need to stay in shape. 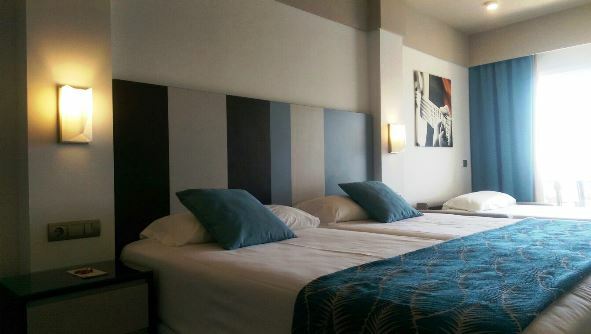 There are a total of 8 rooms suitable for disabled guests and the hotel meets the standards of accessibility and safety (as per Spanish legislation). All public areas are accessible for disabled, too. 3 of the 4 pools have a chair to lower clients with disabilities into the water and life guards are on hand to assist if needed. Only the pool used for water sports does not have the chair. I would recommend if traveling from the UK to price a package holiday here as you can save quite a lot of money booking flights and hotel together rather than the hotel directly with Riu and separate flights. Double rooms start from €160 in low season rising to €270 in peak summer on a 24hr all inclusive basis which I believe is great value for money and prices are very competitive with other hotels in the local area. If I could pick any gripe with the hotel, it would be that the buffet restaurant did seem to get a little crowded at breakfast and later in the evening for dinner. 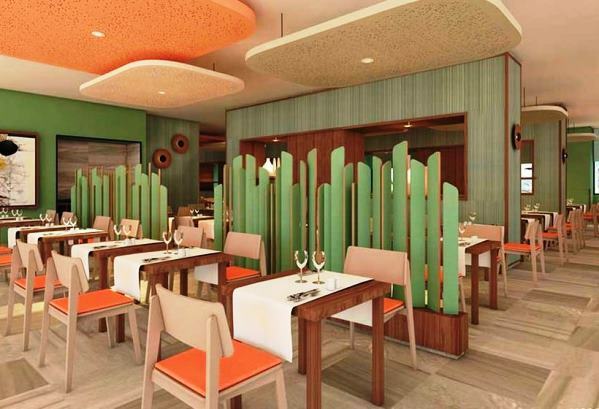 Tip – Sit away from the main thoroughfares in the restaurant. Also only 1 choice of red, white and rose wine available. ​A little bit more choice would be nice especially if spending more than a few days at the hotel. So did the Riu promise live up??? Yes!! 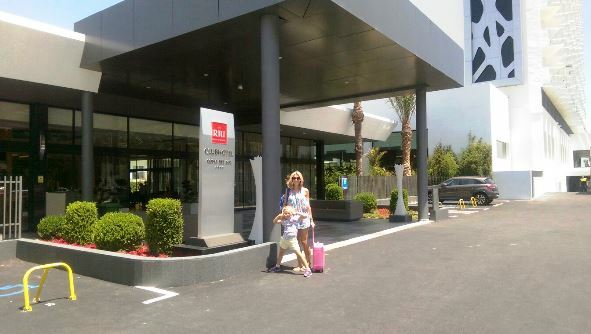 We had a fantastic time at the Riu ClubHotel Costa del Sol and will 100% return some time in the future. Keep an eye on the latest 24 all inclusive rates and special offers! 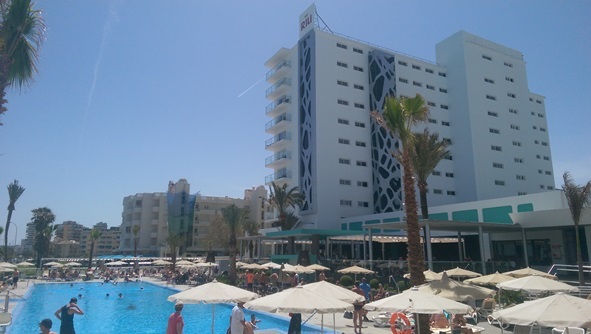 Have you stayed at the Riu Costa del Sol? Leave your opinion below! Did I miss something? Ask me a question in the comments below. Hey, so glad you took the time to comment on my review post having stayed there. It’s invaluable to me to hear what other people think of something I’ve reviewed, whether they agree or not. It helps me to see what others look for in a holiday/hotel also. 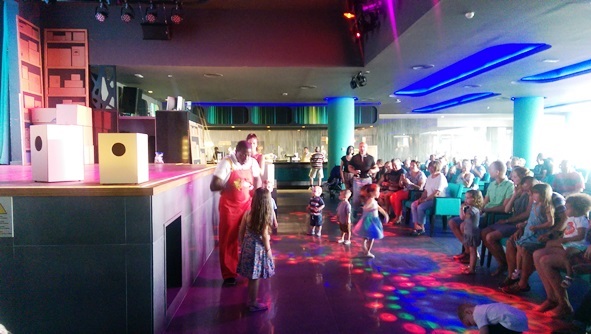 The in-house entertainment is the same I’ve seen in EVERY Riu hotel I’ve been to since 2009! It never changes…. The cocktails weren’t up to the usual standard- far too watery for some reason. And we’ve booked up for next year, but this time directly with Riu as it was a much better price and the hotel is SO close to the airport, services with budget carriers. One tip- always sign up for the Riu member card, even if you’ve booked through a travel agent. It’s free ans the rewards points discount any direct booking you make with Riu. Saved us £400 on our booking! hi Stuart. Thanks for reading the post and taking the time to comment. You must have stayed here just after us and I have to say I agree with what you said about this hotel. 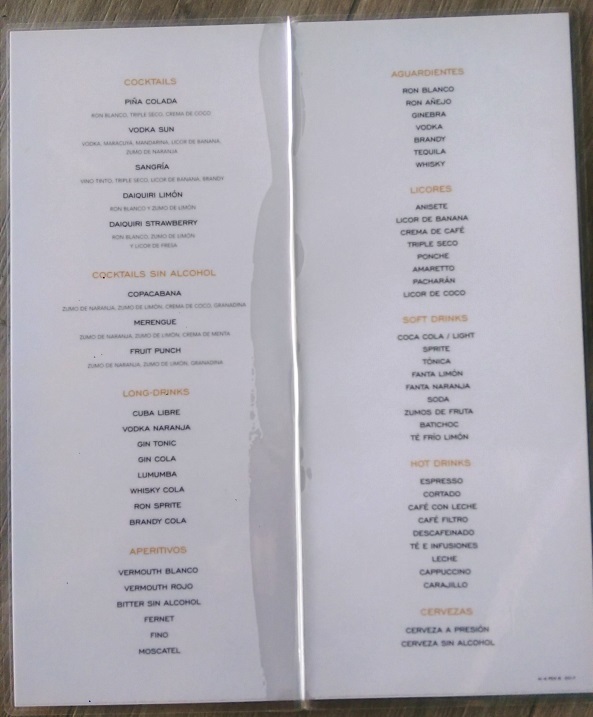 The cocktails did let it down a little as I mention in my review and yes we have also stayed in other Riu hotels and the entertainment was very samey. But this wouldn’t stop me from staying here again as overall it was a fantastic well run, family resort. Excellent saving you made on your 2018 booking too, great tip about signing up for the Riu member card!!! Enjoy your holiday, I hope it comes round quickly.